The Sandman Signature Langley Hotel is the newest hotel in Langley, British Columbia. This Candian privately-owned hospitality company has over 50 properties, most of which are in Canada, but they also have three in the United Kingdom, including one at the Gatwick Airport if you find yourself flying on Norwegian Airlines, and one in the United States (Texas). Last December, I was hosted for two days by the Sandman Signature Langley Hotel and Tourism Langley. This stay marked my very first experience with the Sandman Hotel Group. The hotel is modern in style with very comfortable and spacious rooms. I also found it to be a great base camp for exploring the area’s wine trail and Fort Langley National Historic Site. If you like the city and nature, Vancouver, North Vancouver, and a handful of Provincial and Regional Parks are anywhere from 5 to 35 minutes away. Disclosure: You can help support my small town travels by using the affiliate links in this post. Using the link is at no additional cost to you, and provides a small commission to me to help support my blog. It is hard to describe the lobby at the Sandman Signature Langley Hotel for it is a little modern, a little Steampunk, and a little retro. The entrance of the hotel is reminiscent of a modern-day lodge with wooden beams and curved sculptures. Inside the lobby, it is spacious with three faux-marble check-in counters. Above each counter are dangling glass light bulbs, on the wall behind them, is a two-story wall of Victorian-style images with women’s faces. On the opposite side, is a large sitting area with a contemporary purple and gold couch, a backless couch, plush rugs, chrome lights, and a row of electric fireplaces. The juxtaposition of the two makes for a striking impression. The hallways are minimalist in style and adorned with evocative contemporary paintings that you can’t help but look at. There are plenty of ways to get the local scoop. Check out hotel reviews and deals at TripAdvisor or Hotels.com. I stayed in a Signature Loft King Suite with an upstairs and downstairs. This room style has a ton of space and includes a lower level with couch, flat screen TV, a kitchen area, a desk with an ergonomic chair, and a bathroom. They use the term kitchenette, but it is more like a kitchen for it has a small fridge, microwave, cooktop, and dishware. The only thing you won’t find is an oven. Upstairs is a cozy open loft room with a bed and an additional TV. The room’s decor is contemporary with historic photographs from the area, and a long two-story window lets natural light inside. As a solo traveler, it had too much space for my needs, but I do like spacious rooms and ended up using every single area in this suite. I also found myself gravitating more toward the downstairs than upstairs. I think having the two levels made the room feel homier and inviting. Hotels with upstairs and downstairs and kitchens are great for couples, friends, or budget travelers want to make some meals in the room and enjoying having a designated area for dining and conversations. I think this style would also be suitable for families of three, as one child could sleep comfortably on the downstairs couch (It does not turn into a sofa bed). Other signature guest rooms include a king, double queen, corporate king suite with a kitchenette, and an executive king suite with a sofa bed and a kitchen, and some have a Jacuzzi. Want to do something unique and historic for the holidays? Read about my experience at A Fort Langley Christmas. I had busy days during my visit, and on top of that, I forgot to bring my bathing suit (yes, again!). So, I did not get to spend any time relaxing in the pool or hot tub. I did check it out, and while it is on the smaller size, I did like that it had a row of floor to ceiling windows on one side for added sunshine. Other amenities include a fitness center. One amenity I did have time to check out was Moxie’s Grill and Bar. This full-service restaurant is attached to the hotel. Since it was cold outside, I decided to go to the restaurant through the hotel. Finding the restaurant this way turned out to be quite an adventure as you walk down a series of hallways, upstairs, downstairs, and more halls. At one point I wasn’t sure if I was even going in the right direction, but I did find it. The other is by exiting the hotel and walking down the sidewalk to the restaurant entrance, which is what I would recommend. They have lots of tasty items on their menu such as steaks, burgers, and pasta as well as Ocean Wise fish, vegetarian and gluten-free items. Since I’m a steak lover, I opted for the 7 oz. Sirloin with veggies and a twice baked potato. All of their steaks come from Canadian ranchers and are aged of a minimum of 32 days (yum!). Paired with a Canadian red wine – perfection! 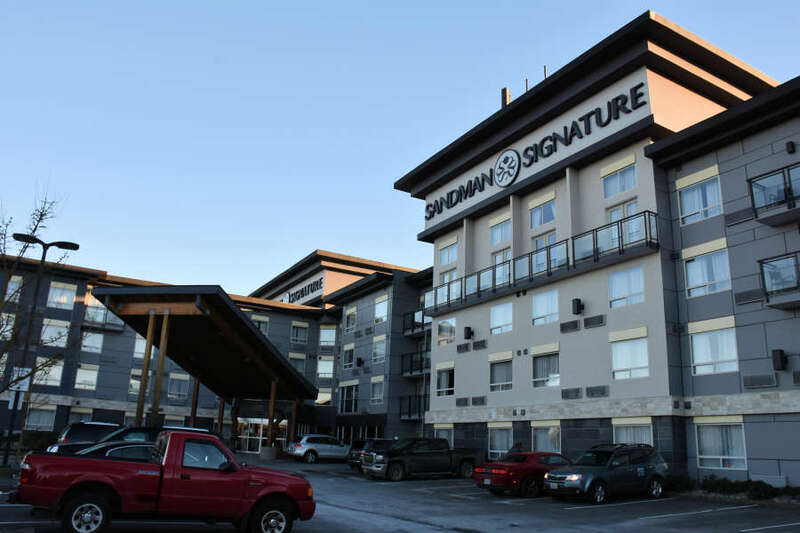 The Sandman Signature Langley Hotel is in a great location and nothing, not even the big city, is too far away. Since the hotel, is one of the area’s newest, it is outfitted with rooms with modern conveniences and is also close to dining and shopping. One drawback is the lack of a complimentary breakfast, which has pretty much become standard at brand hotel chains. While I sometimes skip breakfast, it does make the start of the day so much easier for travelers, and easier on the wallet, especially those with children. While I don’t think I’d choose the loft suite for myself on a solo travel trip, I would reserve the Corporate King with a kitchenette as having a little extra space and a kitchenette for reheating food or preparing light snacks is such great perk. To find out more or book a room visit the Sandman Signature Langley Hotel. If you are a resident of British Columbia, Alberta and Washington State, they offer 25% off the standard rate during select dates (usually October 1 to April 30). If you have time, make a trip to Honey Doughnuts in Deep Cove. This is one of Kate Winslet’s favorite donuts! Drive times: It is a 35-minute drive from Vancouver, BC, a 45-minute drive from Vancouver International Airport, a 2.15-hour drive from Seattle and a 2.25-hour drive from Sea-Tac International Airport. Dining: I did not get to experience the food scene as much as I would have liked. I did dine at Moxie’s Grill & Bar, and Trading Post Brewing Company in the village of Langley. Both I would recommend. Nearby restaurants you might want to to try are S + L Kitchen & Bar and The Keg Steakhouse & Bar. If you love donuts, plan a day trip to the quaint village of Deep Cove and go to Honey Doughnuts. Kate Winslet stops here when she is in town for her donut fix! Activities: Nearby is Mt. Seymour Provincial Park, Pinecone Burke Provincial Park, Golden Ears Provincial Park, Colony Farm Regional Park, Surrey Bend Regional, Campbell Valley Regional Park, and more. I didn’t have the opportunity to explore these parks, so I cannot comment on them. If you love history, I would suggest visiting Fort Langley National Historic Site. This former trading post is open year-round and a mix of hands-on activities and exhibits with guides in costume. I spend the day here for A Fort Langley Christmas and really enjoyed it. Discover more about Langley, British Columbia, by visiting Tourism Langley. 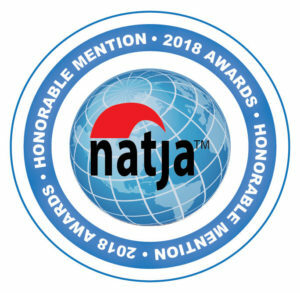 As is common in the travel industry, the writer was provided with accommodations and experiences for the purpose of review. While it has not influenced this review, the writer believes in full disclosure of all potential conflicts of interest. Wow! Your room looked really luxurious. I love staying in newer hotels as everything is up to date, modern and the amenities are plentiful. Looks like this Langley Sandman hits all the marks! And such a great location also. I am in Vancouver a lot. Might just have to give this hotel a try! Sandman Signature Langley Hotel seems amazing. The rooms seem extremely comfortable and spacious. Loved your honest review about your stay in the hotel. Would like to stay here when I visit. FS, Thanks so much for commenting! I have heard of the Sandman Signature brand and wondered how they were to stay in. I LOVE the interior of the Langley-it’s very unique. The loft is also cool and setup and I like that there’s a kitchen. The upstairs/downstairs does give it a homey feel. Like you, I don’t like that there isn’t a breakfast, but I find that a lot of hotels with kitchenettes don’t include one as it’s easy to get or make your own in that kitchenette. Gotta try out Honey Doughnuts, yum! Why are there so many hotels that look so uninteresting from the outside and dreams that have come true from the inside? I think the architects should also use more detail for the facades. From the inside, I really like the hotel. It looks very modern and luxurious, it has style. Thanks for sharing wonderful reviews on sandman signature Langley Hotel. I am highly impressed by the elegant lobby with minialist and stylish settings. I would also love to taste Kate Winslet’s favorite Honey doughnuts. Clean, comfortable and spacious – everything you need in a hotel! I’ve been recommended Sandman Signature in the past but have yet to stay at one, though it definitely looks right up my alley. The pool, hot tub and fitness center are nice touches as well! Erica, Staying there made me want to check out more of their locations. Good to know others have recommended this brand to you. This is the first time I’ve heard about this hotel. I like how interesting the lobby is and the rooms look so fresh with a great layout. I love staying in places that have a kitchen and great that they do since they don’t offer breakfast. Candy, The kitchen would come in really handy for breakfast. I seem to always have leftovers when I travel and having actual plates and silverware was super nice for reheats. I’ve never been to Langley before, but I may consider it in the future. The Sandman Signature Langley Hotel looks pretty nice. The Loft King Suite would be pretty fun to stay at. Astrid, Langley is so close to me and I hope to go back and explore. Hopefully, I will and I can share more things to do there! Love the hotel lobby’s color scheme. So pretty and chic. The reading lights on the bed are a nice touch, too. Melody, The lobby was such a mix of styles that I couldn’t help be wondered by it. My favorite was the Victorian wall with the ladies faces. The loft room looks lovely. I like the idea of a separate living space, especially if the stay is longer for one night. It’s nice to not always be staring at the bed when you’re in a hotel room! The artwork in the room looks quite elegant – I enjoy seeing historic photos of an area and compare what it used to be like to what you see there today, it’s so fascinating! And while it’s nice that they have a good restaurant attached, I would be disappointed like you were that there isn’t a breakfast option for the hotel. Hi! I’m Lara! A forty-something travel who snaps photos of food, geeks out over history, goes hiking and zip lining, and most importantly loves small towns! I’m on a mission to find the best small towns and what to do, where to stay, and where to eat. Hopefully my discoveries will inspire you to dream big and travel small!